We have already explained what the Hanuman Chalisa is all about in our previous article. In this article we will discuss the benefits of reading Hanuman Chalisa on a regular basis. We hope that this will help you to appreciate and understand the strength of the Hanuman Chalisa. Lord Hanuman is considered to be a part of Lord Shiva himself. It is said that this part of Lord Shiva was taken to the womb of Anjana (mother of Lord Hanuman) by the God of the wind “Pavan” and hence the name Pavan Putra or Son of Pavan. Hanuman was a very naughty child and he was full of energy. He had too many questions as a result nobody wanted to teach him. He was strong and very swift. Once he thought of sun to be a sweet and went to engulf it. Lord Indra stopped Hanuman and hit him with the Vajra. Lord Hanuman became unconscious and he fell on to earth. His mother Anjana was very upset and was crying inconsolably. All the Gods came to the scene they saw that Hanuman was badly hit by the very powerful Vajra. The gods decided to bless Hanuman with life. All the gods blessed him and gave him different powers. He became the favourite of all the gods. This is exactly why it is said that worshipping lord Hanuman is equal to worshipping all the gods. He was also blessed by the Lord of death that he will die only when he wants to. If the Hindu mythology is to be belived Lord Hanuman is cheeranjeev (immortal). He is still living on earth and comes to protect those who call him and need him. He will be on earth till the doomsday. Lord Hanuman met Lord Rama when the later was searching for his missing wife goddess Sita. Lord Hanuman promised Lord Rama that he will help him in his search and he kept his promise. Lord Hanuman became an ardent follower of Lord Rama. Lord Rama also loved him and considered him like his own brother. Lord Rama was the incarnation of Lord Vishnu himself. Lord Hanuman did many impossible tasks to help Lord Rama in his battle against Ravan. It is said that even today when Lord Hanuman hear the praise of Lord Rama. He cannot control himself and comes to the place where the praises are sung. Lord Hanuman had said once that he will stay on earth as long as the name of Lord Rama is recited. Hanuman Chalisa was composed by Tulsidas. He was a famous poet and also an ardent follower of Lord Rama. In these verses he says great things about Lord Hanuman and explains how Lord Hanuman was. The Hanuman Chalisa may take ten to fifteen minutes to read in the beginning. When you read it regularly you can learn it better and also it takes less time. Anyone no matter what their age is can read the Hanuman Chalisa. We recommend that you read the Hanuman Chalisa daily. If you cannot do it daily then try to read it for at least 108 days continuously. This can lead you to the path of salvation and protect you from all the evil. The Hanuman Chalisa must be read after you take a shower. Preferably in the morning will be a better time to read. Once you start reading the Hanuman Chalisa regularly you yourself will start to realise all the benefits that can be associated with reading the Hanuman Chalisa. The Hanuman Chalisa is powerful and you must treat it with respect. You must not recite the Hanuman Chalisa in a wrong manner. Of course anything done with faith will surely work but still try to get the correct version of the Hanuman Chalisa and start reading it. After reading the Hanuman Chalisa you must chant Om 108 times. It pleases the lord Hanuman and ensures that you and your family are blessed. Reading the Hanuman Chalisa as the first thing in the morning will ensure that your day goes well. The Hanuman Chalisa will help you to feel relaxed and help you to forget about all your tensions for sometime during the day. Reading the Hanuman Chalisa can fill a person with a divine sense of joy. It is said that when you feel that your house is being attacked by some evil spirits Lord reading the Hanuman Chalisa ensures that the evil spirits stay away from your house. The evil spirits are always scared of Lord Hanuman. Try to understand the meaning of the Hanuman Chalisa as you read it this will help you to appreciate its powers even more. When the Hanuman Chalisa is read to a person who is not feeling well it can help them to feel better and more at ease. People who do not have confidence and are scared of things must read the Hanuman Chalisa. It will help them to feel more confident. The Hanuman Chalisa can help you improve your personality and face all problems in life better. Lord Hanuman is considered as a lord who can solve any problem and do any task that is considered almost impossible. If you have such a task to accomplish then read the Hanuman Chalisa. It will ease the task for you and make you successful in it. Reading the Hanuman Chalisa before you leave for a journey ensures that the journey goes well. You will see that many vehicles have the idol of Lord Hanuman dangling in front. 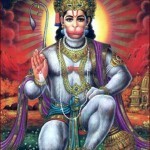 This is because it is believed that Lord Hanuman can prevent accidents and ensure success of the trip. When in trouble reading the Hanuman Chalisa can solve the troubles. It is said that Lord Hanuman can remove all the troubles and ensure that one gets success. Reading the Hanuman Chalisa regularly can remove all hurdles and troubles from your path and help you become more successful in whatever you want to do. Couples who are planning to get married can read the Hanuman Chalisa 100 times in one day before marriage this will ensure that they have a happy and peaceful married life. If you have problems having a child or you are not able to ensure that your child studies well reading the Hanuman Chalisa can help to solve your problems that you are facing with kids. The Hanuman Chalisa can be read before you go to bed. This will ensure that you get a better sleep. Those who are under the bad influence of Lord Shani can read the Hanuman Chalisa for eight times on Saturday after bath. Reading the Hanuman Chalisa can help you to deal with the pain that you get from physical injuries it also helps you to recover faster. It removes negative energies form within you and also from your house if recited regularly and in an audible manner. The Hanuman Chalisa can help people get fame. It also removes the misunderstandings between the members of the family. Reading the Hanuman Chalisa regularly can help the students do better in the exams. It also improves the power to concentrate. These are the many benefits of reading the Hanuman Chalisa on a regular basis. We hope that it will help you to live a better live and do away with all your troubles. Do keep the points that we have mentioned on how the Hanuman Chalisa must be read to get better results.